Eli then had eight rounds of radiation to both optic nerves to ensure the Leukemia would not spread or form in the left optic nerve, as well. Eli’s battle this time was a very difficult one. Eli lost his electrolyte panel and was rushed to the (PICU) pediatric intensive care unit, where he spent nearly 30 days. During this time, two days before Christmas in 2009, Eli went blind. Eli had what was called posterior reversible encephalopathy syndrome (PRES). Eli’s eye sight did return praise our good LORD. Eli did go into remission and was selected to get two umbilical cords instead of just one for his transplant, a stem cell transplant. On April 27, 2010 prior to the transplant, Eli had endured 2 hours and 42 minutes of full-body radiation, and received heavy doses of chemotherapy drugs. Eli had no immune system for 19 days. All of this was to allow his body to accept the new stem cells, Eli then had to have a procedure done, an endoscopy, and during the procedure the doctor perforated his stomach, He then had the battle in the (PICU) once again for losing blood internally and this caused a massive hematoma that closed his stomach off; therefore, he could not eat. Eli was placed on a respirator for 6 days as the machine breathed for him. He then had a 3-hour procedure in which the doctors went in and closed off the bleed sight. Over the next few months, the hematoma went away, another miracle from GOD. He spent 113 days in the hospital during this time. Eli was able to return home and spend Halloween, his big brother Austin’s 14th birthday, Thanksgiving, His 10th birthday with friends, and we spent a special Christmas, and New Year’s at home together. This was the best Christmas we ever had, and we’ll never forget it as long as we live. Eli then relapsed again on January 13, 2011. Eli never once complained during any of the treatments, or procedures. Eli had a prayer list and would pray for others at night. When Eli was finished praying one night we asked him if he remembered to pray for himself. Eli would say “I forgot about me.” I also wanted to take a moment to let you know how proud we are of his big brother, Austin. Austin never complained about the time we needed to spend by Eli’s side in the hospital. Furthermore, Austin has been able to keep up his grades; he is an A-B student. 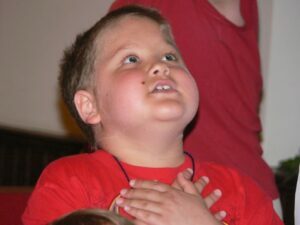 Eli peacefully went into the open arms of Jesus on January 20, 2011, at 5:15 am. Eli Seth Matthews Leukemia Foundation,Inc. we are a 501 (C) (3) foundation. Thank you Eli was my HERO in life so Brave and never once complained. Alexia, Thank you so much. We miss our Angel Eli so much. Hi. My name is Carly. A couple weeks ago you came to my school and i got one of the bracelets that Eli made!!! When you talk about him and what i have heard he seemed like a great great kid! Carly, thank you Eli was a true HERO he was my HERO in life. John, thank you. Yes Eli was my HERO in life, and I miss him so much. what a sweet little guy. I wish I would of had a chance to know him. I hope to attend the bike ride in June in memory of my friend Dave to help find a cure. I hope you can make it as well. I will carry out Eli’s wishes to find a cure of die trying. Yes Fight For Eli they were on 98 ROCK….. You can friend me on Facebook at Paul Matthews, and then like Eli’s page, and Fight for Eli’s page as well. This is the Sacred Heart Newspaper and we wanted to tell you that we found Eli’s story very inspirational and that we are sharing his story in our newspaper. We are writing his story and his fight against cancer. Thank you all at Sacred Heart. I would love a copy of the paper, and if you would like me to speak at your church please let me know. GOD BLESS YOU. Hi.My name is Narquisa.I spoke with Mr.Paul on yesterday just wanted to let you how heart felt and inspirational Eli’s story was. I could tell he was a strong trooper and even while going through is own situation he took the time and prayed for others.God Bless You. Thank you Narquisa for not only writing down Eli’s web site, but reading his story. GOD BLESS YOU. We need more people like Eli… Praying for others during that time says a lot about his character. I appreciate you dropping by the coffee shop. This a humbling story and even if there is pain now, he is in heaven and you will get to see him again one day. Thanks again for being humble and making a difference in other peoples lives. He IS a hero!! Kaison, It was great meeting you while in Atlanta. Thank you for reading about my HERO in life. Stop by the site often to see what we are up to in this fight against childhood cancer in my son’s memory.